So: it took the best part of three years, eight rewrites and many sleepless nights – but I’m happy to say that, as of autumn 2013, I’m finally publishing my first completed novel. It’s called Under The Arcade, it clocks in at 53,000 words (186 pages in print) and it’s best described as a piece of literary fiction. Perhaps my first novel should in fact be called a novella. It’s tough to say, because the classifications for novels and novellas are hazy at best. It all comes down to a subjective matter of word count. Literary agents will tell you that a novel must be 80,000 words or longer; anything less is a novella. But some established bodies – the British Fantasy Society, for example – consider 40,000 words to be the point where the novella ends and the novel begins. In his famous 1927 treatise Aspects of the Novel, E.M. Forster declared that a “fictitious prose work over 50,000 words” should be categorised as a novel. So where to turn when deciding which camp your 53,000-word manuscript falls into? I’ve always wanted to write a full-length piece of prose but something has always held me back. A lack of inspiration, a lack of confidence, a lack of commitment to see the job through: something always seemed to be lacking and I knew that authoring a novel was no job to take on lightly. So I waited and waited, all through my 20s, until I felt I had something to say and the right tools to say it with. That night, I sat down at a blank screen – the same blank screen that’s defeated me many times before – and started to write Under The Arcade. It quickly took on its own momentum and came to a natural end, three years later, at 50,000+ words. 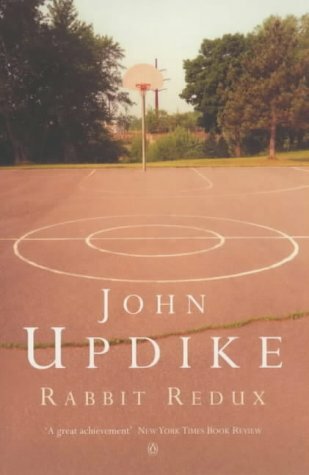 Under The Arcade charts one day in the life of Jackson, a young man who returns to his hometown on the anniversary of his brother’s death. On the hottest day of the summer, he roams around his old neighbourhood – trying to process his grief and make sense of the past. The town he wanders through is a lightly fictionalised version of Sutton, the borough in south-west London where I grew up. Sutton is one of the keystones of my novel and it’s almost a character in its own right. It acts as a catalyst for some of the themes and subjects I wanted to explore: memory, nostalgia, regret, ennui. 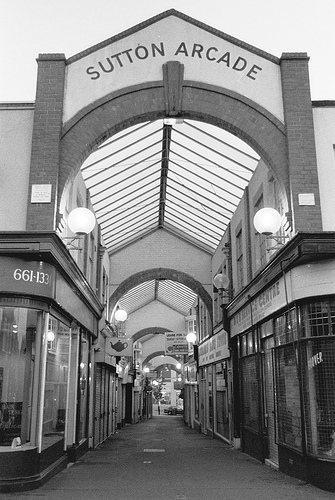 The title of my book refers to a glass-roofed arcade that still stood in Sutton when I was a boy in the 1980s. Built in 1926, it was a unique piece of inter-war history that gave the town some added architectural charm. When it was knocked down and replaced by a Virgin Megastore in the 1990s (thank you Richard Branson), I remember being shocked that the Sutton locals – and the borough council – could so willingly erase such an asset from their town. To my mind, Sutton has declined rapidly in the last 20 years. You only have to take a short walk down the high street to find boarded-up shops and angry, antisocial people. I felt I had to use it as a cultural backdrop; not only because I spent my childhood there and know it like the back of my hand – but also because Sutton’s vanished arcade seemed to symbolise everything that’s eating away at the town: a lack of community, a loss of pride, a total indifference to the past, present or future. Urban decay is a prevalent feature in many British towns. I hoped, with Sutton – which is never explicitly named in my text – to strike a chord with anyone else out there who feels like their neighbourhood’s falling apart, brick by brick. Even as I write this, the things I used to love about Sutton are being torn down. There’s an old Victorian wall close to my parents’ house that’s well over a hundred years old (described on p.54 of my novel, if you’re interested). When I drove past it just the other week, half of it had been demolished. And the old primary school pond that used to sit behind it (p.50) was gone, too. Another keystone of my novel is the subject of grief: how it works on the mind and how it colours perception. In Under The Arcade, Jackson is mourning the death of his younger brother Sean. He wants to revisit his past but at the same time he wants to avoid certain parts of it. He holds back the memory of Sean for as long as possible – and when it finally demands his attention (see the boxing sequence at p.98), he’s keen to suppress it and move on to other things. This is one of the effects I was hoping to create: the sense that surface details are masking the true depths of an inner struggle. I wanted Jackson to walk around in a self-imposed daydream, seeing the world through a distracted filter that occasionally gives way, revealing the deeper turmoil hidden beneath. 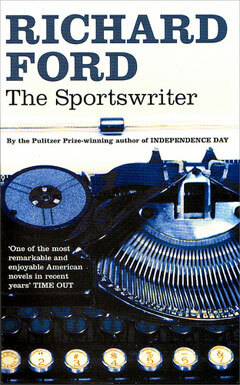 Another novel that does this well is The Sportswriter (Richard Ford, 1986). 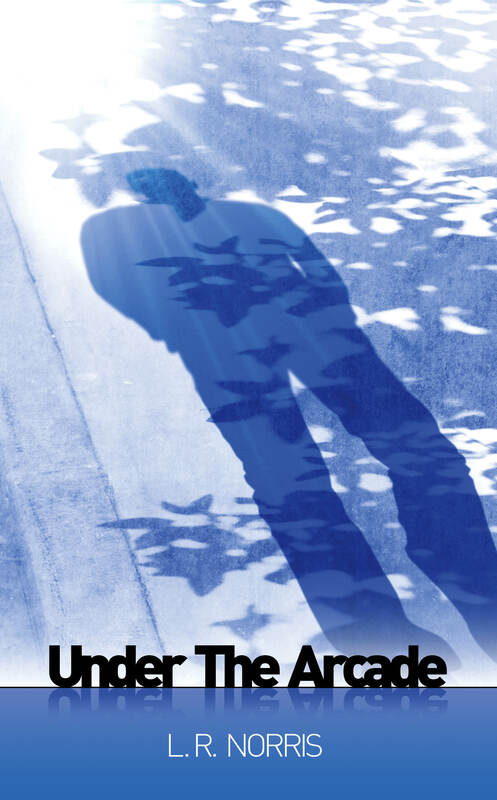 In that book, the lead character tries to cope with his recent divorce and the death of his eldest son. He finds himself in a restless, “dreamy” state in the suburbs of New Jersey – focusing on the routines of daily life, in an effort to heal and forget. But the sense of loss is always there in the background, gnawing away at his composure. Ford captures this perfectly, largely through inference and the things he leaves unsaid. It was a memorable style of storytelling and it’s always stuck with me. I’ve always been fond of fiction that takes place in the suburbs, too. American writers are particularly adept at this subgenre – Richard Yates (Revolutionary Road, 1961; Young Hearts Crying, 1984), Sylvia Plath (The Bell Jar, 1963) and John Cheever (The Wapshot Chronicle, 1954) immediately spring to mind. As do most of the short stories of Raymond Carver. I love the tree-lined streets of suburbia and the restless, angst-ridden literature inspired by it. So it was an easy choice to set my first novel there. We have no shortage of leafy suburbs in Britain, so I wonder why more of our novelists don’t write about them? Another big influence I have to mention is William Faulkner and his astonishing 1929 novel, The Sound and the Fury. If you can get beyond Part 1 of this book, narrated in stream-of-consciousness by a raving lunatic, your efforts will be rewarded. It’s one of those books that can genuinely change the way you look at life – especially Part 2, an achingly beautiful piece of writing about the inner strife of Quentin Compson. Quentin is a young man studying at Harvard, who takes a long walk through Cambridge on the day of his death. As he roams through the city, his thoughts churn between the past and the present in some of the most exquisite prose I’ve ever come across. I’ve read many novels in the last thirty-odd years and Quentin’s section in The Sound and the Fury is the only passage of literature that’s ever made me want to break down and cry. It’s powerful stuff! I want to close with a quick comment on the style of writing you’ll find in Under The Arcade. I chose very consciously to adopt dense, florid description for my first novel. I did this because I admire writing that demands something back from the reader. Creative writing gurus are always advising new authors to “write what you know” and craft something that you yourself would want to read. And that’s exactly what I’ve done. I’m sure, however, that it won’t be to everyone’s taste. One agent who rejected my manuscript told me: “To get away with this level of detail, you need to earn your stripes as a writer beforehand: and you haven’t.” The idea that description and detail was something to “get away with” really stuck in my craw, at the time. Ever since Ernest Hemingway came along with The Sun Also Rises (1926), the “less is more” approach has become the unofficial golden rule for all novelists everywhere. Although I enjoy Hemingway’s economical style of writing, I don’t understand why it should be the template that everyone else should follow forevermore. Why shouldn’t a book swamp you with empirical detail? Novels like Under The Volcano (Malcolm Lowry, 1947) and The Alexandria Quartet (Lawrence Durrell, 1957-1960) do this to splendid effect. Why not revive the spirit of Modernism, from time to time? I’m sure it’s due for a comeback. Will Self tried something along these lines recently with Umbrella, to generally accepted success. In my head, my lead character Jackson has what C.G. Jung called “innate sensitivity”. 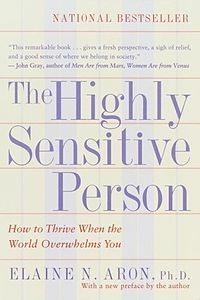 In today’s terms, he’d be labelled a Highly Sensitive Person. As an HSP, he’s processing exterior detail at a higher level than most and his grief is exacerbating the experience. Hence the heightened description, the magnified perception, the feeling that the outside world is infinite and overwhelming. Maybe the desire to write in this way is a side effect of being a copywriter by trade. Every working day, I try to cram as much meaning as I can into as few words as possible. I even keep a syllable count, rarely going above three syllables per word. But when I write for pleasure, the freedom to let language run free is just too tempting to resist. I hope Under The Arcade is no less enjoyable for that. And I hope it offers the kind of escapism that factors in the pure joy of words. But I’ll let you, the reader, be the final judge.